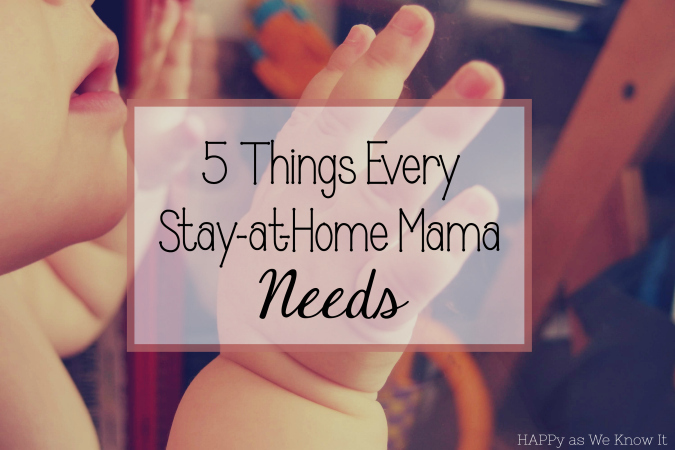 5 Things Every Stay-at-Home Mama Needs + A Giveaway! 1. Moments to recharge. Soak them up whenever you can get them. Take advantage of pauses in the day whenever they come (which sometimes isn't all too often). I'll be honest, these moments are such a critical part of "filling up my cup" as they represent my precious time to be still, connect with God, pray and refuel in whatever way, shape or form I need that day. If you are a napper, give yourself permission to nap. If you prefer to sit and bask in a cup of coffee or tea, do it. If you want curl up with a bowl of secret ice cream that you don't want to share to watch the latest episode of "The Bachelorette", I say go for it. Whatever helps you to reload. 2. Self-lovin'. As moms we are constantly taking care of everyone else in our family. But in order to take care of them effectively, we need to take care of ourselves too. And we should not feel guilty in doing so. Our families need us to be healthy. They need us to be around, and not only that but be pleasant to be around. I'll be the first to admit, my child hangs out in kid care at the YMCA a few hours each week while this mama gets in a workout, gets work done or even just takes a breather some days. And while I struggled with the idea at first as I didn't feel like it was "fair" to him, I quickly realized that it's actually good for him too. He has a chance to play with other kids and socialize, while I do ma' thing, and we both leave satisfied customers. If your thing is working out, find the time to work it in. If it is a beauty routine or going to get a massage, feel free to pamper yourself. If it's indulging in a hobby or a DIY project, get it girl. Give yourself permission to do something for yourself. 3. Time outside of the house. I have heard so many moms say this, and it couldn't be more true in our house. We need to get out of it. I notice that both of us tend to get a little stir crazy if we are in the house for too long. Thus, I plan daily outings to get us out and about in the community. Sidenote: If you haven't already do so, I would highly recommend following along with local blogs that share family friendly events going on around your city - they are a Godsend. But in all honesty, even on days when we are not up for a big "to do", just going out for a walk, to the park or even to the grocery store (really, though) seems to rejuvenate us both. The fresh air is divine, it encourages me to shower (most of the time) and people watching seriously entertains this kid better than I ever could. Wins all around. 4. Lists. Because mom brain is fo' real, and lists keep me sane. Disclaimer: I am that person who finds absolute and udder joy in adding items to a list just to check them off. But even if you aren't that passionate about them, lists can still be beneficial. For instance, grocery lists keep us on a budget (which is key now that we aren't bringing in two full incomes, especially when I am a total sucker for the newest flavor of Kombucha and a pint of fro-yo). To-do lists help me to set goals for the day and use my time wisely. Appointment lists help me ensure that we end up where we are supposed to be. You get the drift. One caveat I will add here, is that while lists are definitely the bee's knees - be realistic and forgiving with yourself. I have created many a "overly ambitious" to do list in my day. I have learned over time that it pays to stick with what's manageable to assist you in feeling more accomplished. Not only that, but don't be a slave to your list - your job first and foremost is being a mom - and your boss isn't always predictable. Give yourself (and your boss) some grace. 5. Community. Whether this be a group of fellow moms that you meet with on the regular. A parent or two that you know you can call for a last minute playdate. Your best friend who is just a phone call away. Or an online community of fellow mamas and other inspiring individuals that you can connect with - finding a tribe is essential. We weren't meant to do it alone. It takes a village peeps. That being said, I have recently partnered with some talented ladies in my "digital community" to celebrate the "blogiversary" of Hannah (Just Bee Blog), a beautiful mama-to-be, and bring you all an incredible giveaway chalked with all the essentials any stay-at-home mama (or gal in general) needs to recharge, love on herself, get out of the house and create some seriously adorable lists. Check out the deets below. One lucky winner will receive everything listed below in this amazing prize bundle (over $180 value!)! Go ahead and enter the giveaway below! a Rafflecopter giveaway ** The giveaway is for U.S. residents only. Winner of the giveaway will be contacted via email. Although the majority of the prizes will be sent in one shipment, the succulent planter, teething necklace, and family devotion cards/journal will be shipped to the winner separately. Best of luck! !